In the last lesson we started to classify igneous rocks based on their observable properties like texture, density, color, and environment of formation. We were able to do this using the top half of the Scheme for Igneous Rock Identification in the ESRT seen above. In this lesson we will discuss another method of identifying igneous rocks...by determining their mineral composition. 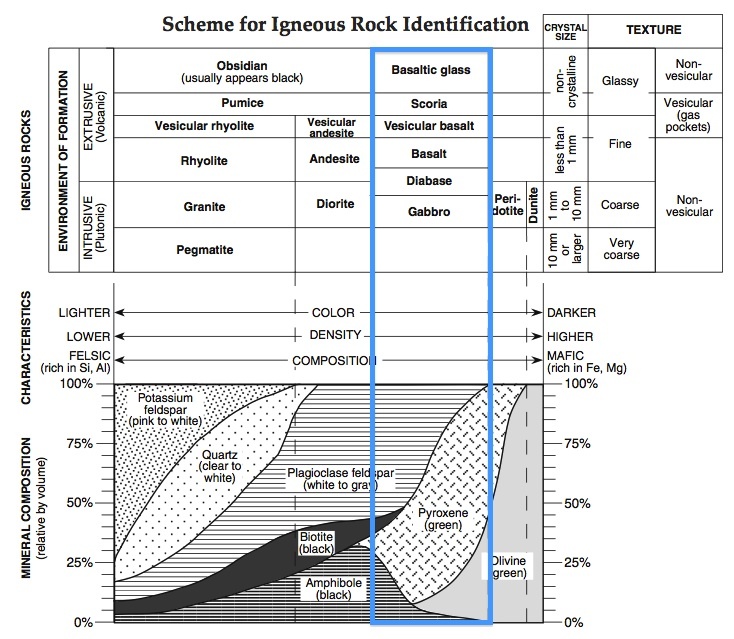 To do this we will need to use the ESRT Igneous Rock Chart in it's entirety. We are already familiar with the top half of the Igneous Rock Chart, so for now lets focus on the bottom half (shown above). This area shows us all of the minerals that can be found in igneous rocks. Notice that the chart is made up of different patterns. Each pattern represents a different type of mineral. 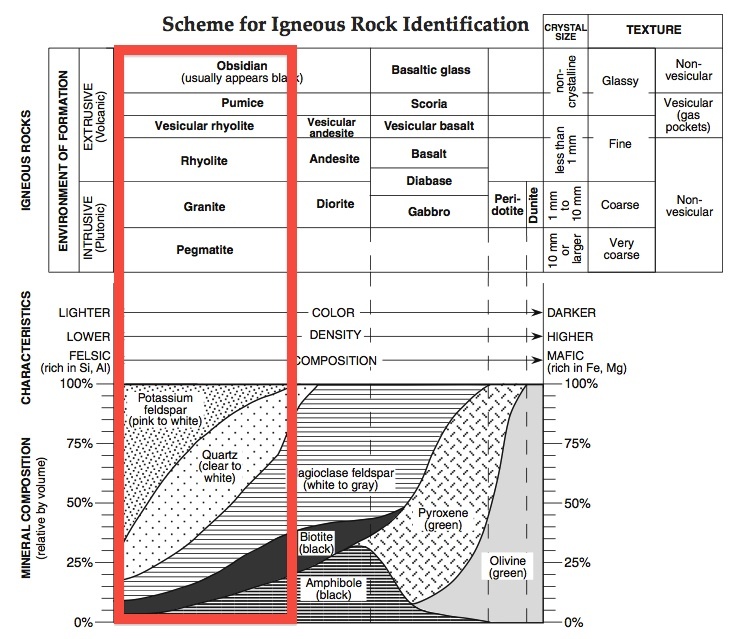 The first thing that we can do using the entire Igneous Rock Chart together is find which minerals are present in different types of rocks. Upon examination it beomes apparent that this chart can be divided into three columns, or families of rock, each with different minerals. 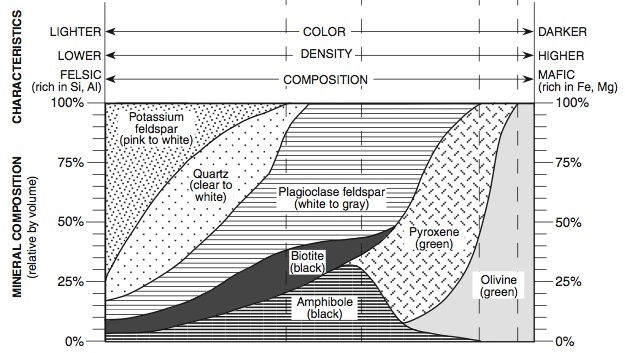 The Diorite Family consists of all of the rocks in the middle column of the table. These rocks are harder to classify because they have characteristics of both of the other families. The have average color, density, and composition. If we know the mineral composition and the texture of the rock we can identify it using the table. What is the name of the coarse textured igneous rock composed of Quartz, Potassium Feldspar, Biotite, and Amphibole? B/c it has a course texture it must be in the course texture row. B/c it has contains Quartz, Potassium Feldspar, Biotite, and Amphibole it must be in the Granite Family in the left column. These characteristics intersect at only one igneous rock - Granite! Let's Practice Another: Which igneous rock has a fine vesicular texture, and is composed of Pyroxene, Olivne, Amphibole, and Plagioclase Feldspar? Fine vesicular tells us it must be in the row of rocks that have a fine vesicular texture. The mineral composition tells us it must be in the Gabbro Family in the right hand column. The row and column intersect at one igneous rock - Vesicular Basalt!